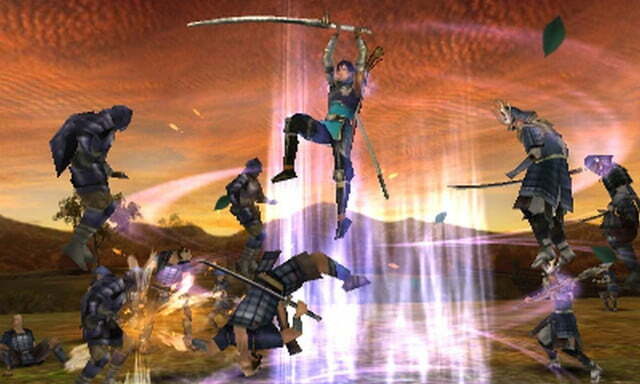 Samurai Warriors: Chronicles is among the best Nintendo 3DS launch titles available, if you are grading on a fairly steep curve that disregards originality. The Dynasty, Samurai and Gundam Warriors series of games are the video game equivalent of romantic comedies, taking the same plot and throwing it at audiences again, and again, and again. They offers lots of mindless fun, but if you have played one, then you have played them all. But when it comes to handheld games, that same franchise may find players who aren’t totally burned out on preceding titles. For Samurai Warriors devotees, Chronicles is exactly what you would expect, meaning you won’t find much to complain about. There are a few sacrifices — the story follows only one character, the right analog camera control has been replaced by the left shoulder button, and the number of enemies you see at one time is lower than you might hope, but these are acceptable losses for a handheld port. For those who haven’t played the other games in the franchise, SW:C is the definition of a hack-and-slash game. Set in one of the more bloody and violent times in Japanese history, you are a samurai, wandering from master to master, and tasked with completing objectives that generally equate to killing everyone. You create a character at the beginning of the game, then sally forth and mow down hundreds upon hundreds of enemies. By the end of the story mode, you will have literally have killed thousands, maybe even tens of thousands of enemies. Basically you are a monster, but in a fun way. The story is just there for background. While you technically create a character, it is just the choice of male or female avatar that you name. From there, you are subjected to unskippable cut scenes that mean very little, and a series of character relationships that you don’t have much control over. As you play, you are generally paired up with other characters to help complete the overall objectives, which you can switch between on the battlefield using the touchscreen. You can also send them to locations and monitor their progress. Switching between fighters with vastly different styles makes the maps fun and more varied, avoiding the monotonous repetition inherent with these titles. Well, maybe not “vastly different”, but different. The graphics in SW:C are fine, but the 3D is a high point. The impressive depth of field makes it among the best-looking 3D titles in terms of the technology. The processing power of a handheld presents some restraints (you can’t see enemies far away, they just appear when you run that direction) but it is still impressive. However, when constantly switching between characters, it takes your eyes a second to readjust to the 3D, which will cause strain eventually. This is something that you will either have to get used to, or you can turn off the 3D altogether. The gameplay doesn’t break any new ground for the genre. You have a jump, two attacks and a special attack, and that is about it. You earn new weapons and level up as you play, but there isn’t a heavy emphasis on it. There is a shop, and the ability to upgrade weapons, but it is generally a matter of just hitting yes when prompted, and there isn’t much skill or thought involved. You can also level up the other characters you use, which will be beneficial for the tougher missions, although you have very little control over who you will team up with. One of the things that keeps people coming back to the series is the ability to play with a friend. That ability is sadly lacking from this title. There is an online component, but it is an odd head-to-head mode that plays more like a card game than the actual game. You basically choose your officers to face your friends’ officers, with the game deciding the victor based on stats. Despite the many negatives of this game and the franchise in general, when it comes to the 3DS launch selection, pickings are fairly slim. While this game is mindless, it is also fun, as long as you are into the hack-and-slash style of games. If you enjoyed the other titles in the franchise, this may be the best 3DS launch title for you — but again, that is grading on a big, big curve. Still, the gameplay is solid, if repetitive, and the 3D looks good. All in all, Tecmo Koei has done a good job of translating their series to the 3DS, flaws and all.